Fluvial erosion, or the removal and transport of silt, sand, gravel and other stream bank materials by rivers, happens when development near rivers and streams meet natural processes. This kind of flooding hazard is less well known than flooding inundation - when land is simply overwhelmed with too much water. It takes into account the movement of water and soil in rivers and, even more important, that rivers must constantly adapt to changes in their paths. Similar to other kinds of hazards, being proactive is the best way to avoid the future damage posed by fluvial erosion. Effects of fluvial erosion range from gradual changes in a stream bank to catastrophic changes in river channel location and size during flood events. 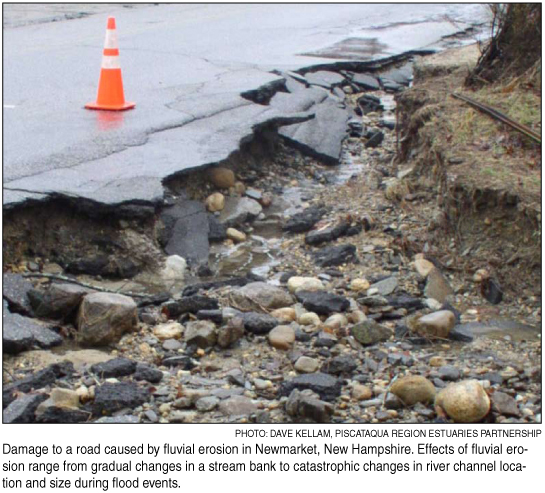 Community residents in Raymond, located in New Hampshire’s coastal watershed, experienced this firsthand during the floods in April 2007, when a stream changed course to blast through a culvert and run over Old Bye Road, shutting down the road for days. As in the case with the town of Raymond, people usually become aware of the fluvial erosion hazard (FEH) when they encounter it on the stream bank. Some areas are geologically prone to river channel instability, putting development located there at risk. Floodplains, or flat areas of land next to the river, containing material easily moved by water, such as gravel and sand, are particularly susceptible. Traditional development patterns often put homes and buildings right along river corridors, unknowingly placing them in the path of FEH. And as land becomes more and more urbanized, seemingly small land use changes can result in problems later. During pre-settlement times, rivers meandered across floodplains and had the room to spread out, keeping erosive forces low. However, as river beds have been manuiplated into narrower channels by humans, they have the ability to gather much more force. Factor in a high rain event, some undersized culverts, and a stream that has been manipulated by humans, and you have a recipe for fluvial erosion at its worst. The river now has high potential to alter course and flood properties as it adapts to the conditions thrown in its path. Keeping out of the path of fluvial erosion is the most cost-effective approach to avoiding potential damage from the hazard. Riparian buffers and floodplain mapping, such as those maps provided by the National Flood Insurance Program, do not plan for protection against FEH because they are based on the river at its most stable condition. A tool used by planners to help avoid FEH is the “fluvial hazard overlay district,” a planning unit based on a scientific assessment of river channel size and location, as well as land uses in a particular area. “An FEH ordinance helps towns minimize flood losses and increase public safety by reducing encroachment in sensitive areas of the river corridor. When the ordinance is implemented, the river will have more room to adjust which in turn will minimize conflicts between the river and adjacent land uses,” said Sally Soule, coastal watershed assistance supervisor at the New Hampshire Department of Environmental Services (DES). To develop an overlay district, FEH corridors are given a sensitivity rating according to their vulnerability to FEH, giving town planners information on where this hazard is most likely to occur. For example, it could be used to place restrictions on development and land uses in the FEH corridors. Building a new structure on an eroding bank, for instance, can be avoided using the information. Geomorphic data used to predict water and sediment flow include width and depth of the river channels and the location of human and natural barriers, such as existing development and beaver dams. Other uses of the data include stream and floodplain restoration projects, bridge and culvert replacement priorities and river corridor protection opportunities. In Raymond, townspeople decided to explore the adaptation of an FEH overlay district. 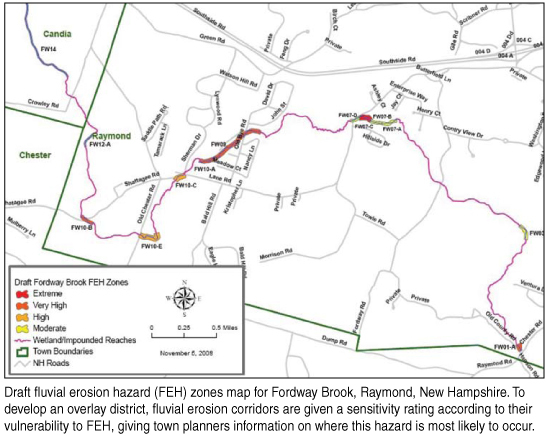 A model FEH ordinance, including an overlay district, was created using data collected from a fluvial geomorphology study conducted last summer in the Exeter River Watershed, which includes the town of Raymond, by the N.H. DES Watershed Assistance and Geologic Survey with funding assistance from the NH Coastal Program. The project was also supported by the Federal Emergency Management Agency (FEMA) and the N.H. Department of Safety, Division of Homeland Security and Emergency Management. The model ordinance is not mandatory, but available for consideration on a town-by-town basis. Although too late for this year’s town meeting, when voters gather to make local decisions, Raymond may become the first New Hampshire community to adopt an FEH ordinance in 2010.